This is a little Patrick Starfish, again, yes? Those look like they may be pockets, but sadly, no. I like this for a baby shower ($34.90). A really adorable plaid dress ($29.95). I'm going to have to go back for this one. I've also got an eye on these maternity skinny jeans ($34.95). Yes, a little oxymoronic, and maybe not so tempting in this summer heat, but these are stretchy and have the belly panel so they're more comfortable than they sound. Also, don't forget, these will be perfect post-delivery before you once again fit into your beloved, normal-waistband skinny jean. Yikes, must read new camera manual, sorry about horrid lighting. The jeans are not purple but dark blue denim, are gathered at the ankle, and have the belly panel. I'd go up a size as they fit small, like regular H&M jeans. The top ($29.95) is white, sheer, and perfect for summer heat. The pink top is $24.90 and a great cut if you're growing through the summer like me. Belly panel! And it is such a joy to be able to get a little on-trend when you're feeling extremely off-the-scales-trend. I've never loved shopping H&M more. But I'm still waiting on my maternity jumpsuit. Camon, H&M Mama, I know you're listening. love the plaid. get it. agreed. I'm going back tomorrow to stalk it. DEFINITELY. That plaid needs to be yours. Went there today! Got a really cute pair of black capris with panel, and the jean shorts. I feel better that I have some pants to wear that aren't totally uncomfortable as I pretend they still fit! SKL - I remember that phase, and the total relief when trying on the scary maternity panel pants! Sadly now one pair of my maternity pants are too tight, belly panel and all. You're even out of the maternity panel pants?? Oh man. I'm sorry! (And fearful). I thought I would hate that big belly panel, but it's really kind of comfy. Not all yet, but a very cute pair of navy gap pants! Want them? They got me through a lot. Embrace the panel, it's your friend. I will gladly take any cute pants if you are through with them! they're yours! Email me if you'd like me to bring them into work this week! The plaid is fantastic on you! Can I still love the plaid even though I'm not pregnant? 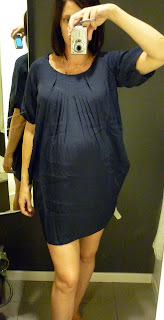 I think it looks great and I love that so many cool stores are doing affordable maternity wear now. Now you can really find cute, affordable maternity, esp. if you're near an H&M with the Mama department! But Forever 21 has its plus-size now, perhaps they need to branch further out?! What great news Miss Fashion, we're so happy you found some goodies you really like! Hopefully, by the time you see this, you will have been able to pop back over for the plaid, what a wonderful look!